NASA OpenVSP (Open Vehicle Sketch Pad) is an innovative tool for creating a functioning aircraft from scratch. 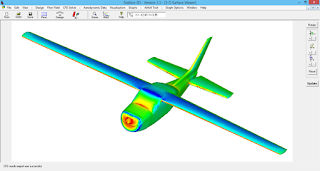 The software is an excellent tool for the conceptual and preliminary design of UAVs, light aircraft or transonic jet. More about OpenVSP can be found at http/www.openvsp.org. OpenVSP is free and runs on most personal computers. I had the opportunity to make a presentation at OpenVSP Workshop 2015. My presentation was an overview of using Stallion 3D to perform the aerodynamics of designs created in OpenVSP. Stallion 3D reads in a design in the .stl format and then computes the aerodynamics performance. Stallion 3D does not require user grid generation. A user can go from design to results of their actual geometry in 2 - 6 hours using Stallion 3D. If you are using OpenVSP in your company to develop unique aircraft designs, please contact me at (352) 240-3658. We can provide you with more information about using Stallion 3D for your particular design.